Invisalign is a series of clear,transparent, removable devices that are used to align teeth to the desirable position. It is used as an alternative to metal dental braces due to its cosmetic value. This cutting edge dental treatment is available in the U.S and a few other countries worldwide. A full set of treatment usually includes 20 to 30 aligners per arch, though the number varies for each individual. Each aligner is designed with exact calculations according to your teeth position to gradually shift your teeth into place. The invisalign system is custom made and each retainer is switched every two weeks. Invisalign is preferred to the traditional metal braces due to its cosmetic value. 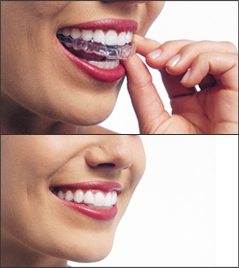 The device is transparent and people hardly notice that you are undergoing orthodontic treatment. It is made of plastic and the edges are smooth, thus preventing irritation to the gums and cheeks. It is also very comfortable to wear because of its smooth texture. It is a removable device which enables the user to remove it when eating and brushing the teeth. This device however,also has its disadvantages. Invisalign is a removable device, meaning that the aligners are not continuously causing teeth movement. The rate of shift depends on the duration of application of the invisalign. The minimum time the aligners should be worn is 20 to 22 hours per day.Therefore the success of treatment depends on the patient’s commitment to wearing the device. Speech may be affected when patients start wearing their invisalign trays. This occurs because the edges of the trays interfere with the movement of the lips and tongue. But as the treatment progresses to the subsequent aligners the appliance do not interfere with speech as much as they do in the beginning. The invisalign system is not cheap and can be more expensive than metal braces. In the U.S the cost of invisalign treatment ranges from $3500 to $8000. The invisalign tray covers the teeth and this does not allow saliva to wash over the patient’s teeth. The patient tends to develop dry mouth and bad breath. Due to the lack of cleansing action of the saliva, the patient may develop dental caries. This can be prevented by practicing high quality dental hygiene. Should the patient fail to wear the aligners for the required time duration, then the treatment will fail because the next aligner in the series will not fit. A new set of impressions need to be taken and extra new aligners made. the occlusal force acting on the aligners can cause damage to the aligners. In rare cases, invisalign causes allergic reaction such as sore throat and cough and toxicity. 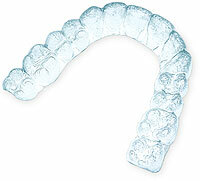 This is due to to the polyurethane content in the aligners. In severe cases, it is advised to discontinue the use of invisalign. Can Invisalign Fix Buck Teeth? This entry was posted in Braces, Orthodontic and tagged alignment, Dental caries, Invisalign, metal braces, oral hygiene, orthodontic braces, orthodontics on September 11, 2010 by dhanya.